Happy National Nurses Week to all you dedicated, compassionate, hard-working nurses out there! While you’re enjoying your free cinnamon bun and coffee, I hope you will pause to reflect on your work and on what truly fuels your continued passion for nursing (or where the heck that passion has gotten to if you have lost it). And if you have time to read more than patients’ chart notes or community outreach notes, I hope you will pick up and read a “real” book written by nurse authors. We may be a small group compared with the vast number of physician authors, but we are growing in strength. I am proud to be a nurse and I am proud to be a nurse author in the company of some amazing, inspiring people. Happy International Nurses’ Day and happy end of National Nurses (no apostrophe, I don’t know why) Week, celebrated May 6-May 12th every year since 1990, thanks to the American Nurses Association—seemingly in conjunction with Hallmark. Is it a strange coincidence that National Nurses Week, National Administrative Professional’s (or Secretary’s) Day, National Teacher Day, and National Mother’s Day are all clustered around the same weeks? Roxanne Nelson, in her Washington Post (4-29, 2003) article entitled “Good Night, Florence,” reports that Unison, Britain’s largest trade organization representing nurses, declared they were ditching Florence Nightingale because she “represents the negative and backwards elements of nursing.” (during their 1999 annual conference). In her article, Ms. Nelson reminds us that Miss Nightingale worked as a nurse for less than three years, including the time she managed a British hospital in Turkey during the Crimean War. After the war—and for the last fifty years of her life—she basically took to her bed with what historians now suspect was a combination of Malta Fever (brucellosis—probably from infected milk products) and depression. 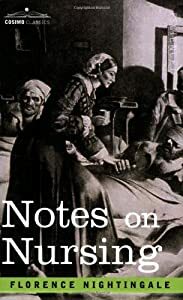 While an invalid, she wrote Notes of Nursing, oversaw the opening of the Nightingale Training School for nurses, and worked on hospital reform of the British military. Florence insisted that nursing was a calling and not a profession.